Once the kids are out of school (June) planning to fly to Las Vegas, rent a car, and drive up 15 to see both Zion and Bryce Canyon National Parks. Found and booked a vacation rental in St. George, UT that will be our home base for the week. Any suggestions on cool drives? Historic highways? Anything worth seeing in addition to the parks? Really that depends on how far from St. George you want to go. The North Rim of the Grand Canyon, Vermillion Cliffs National Monument, and Pipe Springs National Monument are all within reach if you are going up UT 9 to Zion. I'd really recommend taking all of UT 12 to UT 24 since the road is one of the most scenic in the country IMO and it dumps you right in front of Capitol Reef National Park. Snow Canyon is just north of St. George and is pretty nice even if it is a little small compared to Zion. Cedar Breaks National Monument is worth a look as well. Thank you, Max! I'll look into your suggestions! That will be an awesome trip. You can actually drive old US 91 between Littlefield AZ and St George UT. On the other hand, the part of I-15 that old 91 bypasses (the Virgin River Gorge) is really quite pretty. As for other attractions, Snow Canyon is really a cool place to go (and probably much less crowded than Zion). There are also a few volcano cones on SR-18 north of there, and you can hike up at least one of them. The only problem is that I-15 through the Virgin River Gorge is literally one of the few sections of Interstate that would rank pretty high up on the scenery scale. 91 is in decent shape and is even signed as a County Route on the Arizona side. The Utah side of Old 91 is in the middle of a big improvement project through July. When I went through a few weeks ago, there was a 30-minute wait to be led by pilot truck through a really long one-lane section, perhaps 8 miles long. 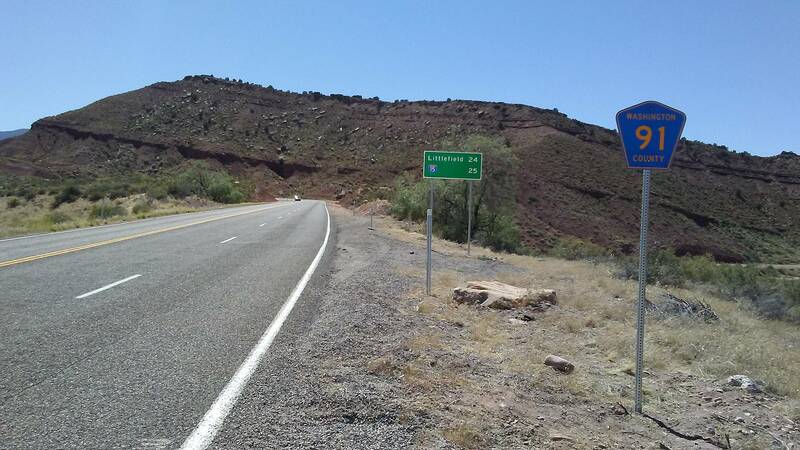 Road work has now begun on an improvement project to improve the safety of Old Highway 91 in Washington County between the Arizona state line near Littlefield Arizona and the intersection with Gunlock Road on the Shivwits Reservation near Ivins, Utah. Work is expected to cause traffic delays until completion in July to 2017. Work will consist of extending culverts, installing new culverts, widening shoulders, removing clear-zone obstructions, cutting back cliffs, new signage, new striping and other various improvements. Some overnight and other short-term road closures are anticipated and will be noticed before each closure. Delays of 30 minutes or more will be common due to lane restrictions and potential safety concerns in the work zones. The work area is 16.7 miles long and work crews will be working at many different locations throughout the project. Reduced speeds will be enforced through the work areas. I really liked the St. George area. Zion is one of my favorite parks. One park overlooked and underrated is Cedar Breaks National Monument near, where else, Cedar City. If you have the time drive Utah highway 12 from US 89 to Torrey, then 24 west to 62 south to Kingston and back to US 89. This goes through part of Escalante National Monument and near Capitol Reef National Park. It is so very different. I did this on a motorcycle in 2009 then went on to Hanksville. I hope I can get back there. I could spend weeks in southern Utah. Of course I like it up in the NE also.